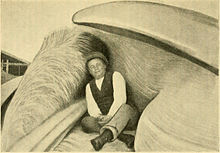 Like all other large whales, the fin whale was heavily hunted during the 20th century. As a result, it is an endangered species. Over 725,000 fin whales were reportedly taken from the Southern Hemisphere between 1905 and 1976; as of 1997 only 38,000 survived. Recovery of the overall population size of southern subspecies is predicted to be at less than 50% of its pre-whaling state by 2100 due to heavier impacts of whaling and slower recovery rates. 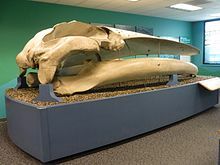 Recent DNA evidence indicates the fin whale may be more closely related to the humpback whale (Megaptera novaeangliae) and in at least one study the gray whale (Eschrichtius robustus), two whales in different genera, than it is to members of its own genus, such as the minke whales. As of 2006, two subspecies are named, each with distinct physical features and vocalizations. 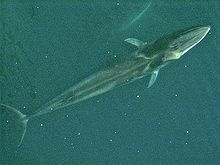 The northern fin whale, B. p. physalus (Linnaeus 1758) inhabits the North Atlantic and the southern fin whale, B. p. quoyi (Fischer 1829) occupies the Southern Hemisphere. 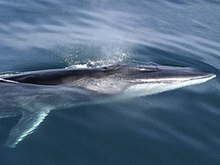 Most experts consider the fin whales of the North Pacific to be a third, as yet unnamed subspecies—this was supported by a 2013 study, which found that the Northern Hemisphere B. p. physalus was not composed of a single subspecies. The three groups mix at most rarely. ^ Mead, J.G. ; Brownell, R. L. Jr. (2005). "Order Cetacea". In Wilson, D.E. ; Reeder, D.M (eds.). Mammal Species of the World: A Taxonomic and Geographic Reference (3rd ed.). Johns Hopkins University Press. p. 725. ISBN 978-0-8018-8221-0. OCLC 62265494. ^ a b c d e f "The IUCN Red List of Threatened Species". IUCN Red List of Threatened Species. Retrieved 15 November 2018. ^ Thompson, D'Arcy Wentworth (February 1919). "On whales landed at the Scottish whaling stations, especially during the years 1908–1914. Parts IV. to VI. The bottlenose, humpback, and finner whales". The Scottish Naturalist. 85–86: 6–16. ^ a b Mitchell, E. (1974). "Present status of Northwest Atlantic fin and other whale stocks". In W.E. Schevill (ed.). The Whale Problem: A Status Report. Cambridge, MA: Harvard University Press. pp. 108–169. ISBN 978-0-674-95075-7. ^ a b c Rice, D.W. (1974). "Whales and whale research in the eastern North Pacific". In W.E. Schevill (ed.). The Whale Problem: A Status Report. Cambridge, MA: Harvard University Press. pp. 170–195. ISBN 978-0-674-95075-7. ^ Sigurjónsson, J. (1995). "On the life history and autecology of North Atlantic rorquals". In A.S. Blix; L. Walløe; Ø. Ulltang (eds.). Whales, Seals, Fish and Man. Elsevier Science. pp. 425–441. ISBN 978-0-444-82070-9. ^ Jonsgard, A. (1974). "On whale exploitation in the eastern part of the North Atlantic Ocean". In W.E. Schevill (ed.). The Whale Problem: A Status Report. Cambridge, MA: Harvard University Press. pp. 97–107. ISBN 978-0-674-95075-7. ^ Williams, R.; Thomas, L. (2007). "Distribution and abundance of marine mammals in the coastal waters of BC, Canada" (PDF). Journal of Cetacean Research and Management. 9: 15–28. Archived from the original (PDF) on 6 February 2011. ^ Chang K.; Zhang C.; Park C.; Kang; Ju S.; Lee; Wimbush M., eds. (2015). Oceanography of the East Sea (Japan Sea). Springer International Publishing. p. 380. ISBN 9783319227207. Retrieved 8 September 2015. ^ Travis Horton (12 August 2014). "Humpback Whale Migration – Rarotonga, 2014". ^ Toro F.; Vilina A.Y. ; Capella J.J.; Gibbons J. (2016). "Novel Coastal Feeding Area for Eastern South Pacific Fin Whales (Balaenoptera physalus) in Mid-Latitude Humboldt Current Waters off Chile" (PDF). Aquatic Mammals. 42 (1): 47–55. doi:10.1578/AM.42.1.2016.47. Archived from the original (PDF) on 19 April 2016. Retrieved 31 March 2016. ^ Pacheco S.A.; Villegas K.V. ; Riascos M.J.; Waerebeek V.K. (2015). "Presence of fin whales (Balaenoptera physalus) in Mejillones Bay, a major seaport area in northern Chile" (pdf). Revista de Biología Marina y Oceanografía. 50 (2): 383–389. doi:10.4067/S0718-19572015000300017. Retrieved 31 March 2016. ^ Acevedo J.; O’Grady M.; Wallis B. (2012). 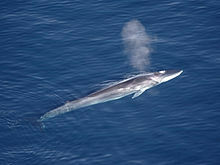 "Sighting of the fin whale in the Eastern Subtropical South Pacific: Potential breeding ground?" (pdf). Revista de Biología Marina y Oceanografía. 47 (3): 559–563. doi:10.4067/s0718-19572012000300017. Retrieved 31 March 2016. ^ a b c Lambertsen, Richard H. (15 May 1986). "Disease of the Common Fin Whale (Balaenoptera physalus): Crassicaudiosis of the Urinary System". Journal of Mammalogy. 67 (2): 353–366. doi:10.2307/1380889. ISSN 0022-2372. ^ Miyazaki N.; Nakayama K. (1989). "Records of Cetaceans in the Waters of the Amami Island" (PDF). 国立科学博物館専報 22, 235–249, 1989. 22: 235–249. Retrieved 16 January 2015. ^ "海域自然環境保全基礎調査 – 海棲動物調査報告書, (2)- 19. シャチ Orcinus orca (Limaeus,1758)マイルカ科" (PDF). 自然環境保全基礎調査: 54. 1998. Retrieved 16 January 2015. ^ "The Fin Whale Passage – Natural History Museum of Los Angeles". 3 June 2010. This page was last edited on 21 April 2019, at 18:03 (UTC).